This idea, spotted on Lovely Morning, is perfect for a fun "getting to know you" activity or guessing game at a baby shower. 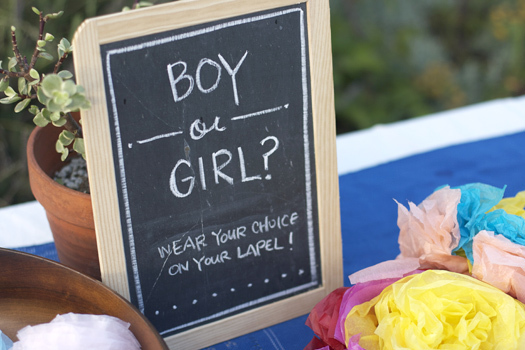 As the sign states, pin a colored paper bloom to your lapel to show off whether you believe the baby will be a boy or a girl (blue or pink!) Get to know other guests by asking why they are leaning towards a baby boy or a girl. This activity could also be applied to bridal showers, by asking guests to wear a specific colored bloom if they are from the bride's side of the family, or from the groom's side of the family. It's an easy activity to try out at the next shower you host!